And although the picture is a public profile picture I don't think people realize that it will hit the front pages for everyone to see. The picture also has your full name on it...hence people (including my buddy) freaked out. He then wanted to go and edit his profile information and picture as to avoid this. I am not against capturing this data - besides we need it when you apply for a job...but I think we need to be careful by at least alerting candidates that their picture and name can be used in an SO advertisement. I certainly think it's the nice thing to do. Warn them or cut the crap about who you're going to "work with..." directly on the advertisement. I don't think that is appropriate at all. Besides who in their right mind starts working at a job just because someone else they know (more times then not they DONT KNOW) works there? When I look for a job I don't pay attention to who works there but I pay attention to mgmt styles, salary, health insurance, family friendly, etc. not who works there. Currently I have the name, the picture, and the company someone works for...Wow with that amount of information I can practically find where this person is (where they live, a phone number, their route to work). It's too much info for little return on investment. Please remove the "who you'll work with" specifically on advertisements. This email has nothing addressing the fact that my information, location, and picture may be used in an advertisement promoting the company I work for. We should also as users be able to OPT-OUT of this and this should not be a process where I need to email SO or talk to my "company admin". 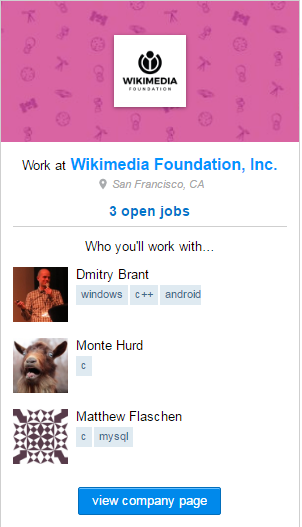 As it stands company admins are the only ones who can remove a person from the list of "people you'll work with". You're absolutely right. We need to be more clear about that. As you noted, participation in a company page is currently explicitly opt-in, but that copy (the email invitation) needs to be much more clear that your avatar *could* appear in Company Page Ads for the company you are joining. A Company Page on Stack Overflow is promotional content for that company. There is currently no other reason to opt-in to displaying your profile on a Company Page other than to advertise that you work for that company. But yeah, we do need to be much more explicit about that in the invitation email, and that is currently being fixed. And, for what it's worth, this is the first time in 4 years (that I can recall) that we've had any complaints or issues about it. Not that it absolves us of responsibility at all, I'm just pointing that out. ~300 running company page ad campaigns, as of last count. So for a given home page view, you're looking at 1/7.5 chance of seeing a CP ad. And if you do, it's a further 1/300 chance of seeing the ad for the specific Company Page that you're a part of (assuming you're a part of one). Granted, our ad serving process isn't entirely random, but those are the raw figures. So while being part of a company technically means you might end up on the front page of SO, the amount of times that actually happens is much, much smaller than that statement implies. Let me re-iterate that I'm not trying to absolve us of responsibility here, I'm trying to give some perspective. As I mentioned above, we are working on fixing the copy of the invitation email to avoid things like this in the future. The basic claim that you will be working with the people is bogus and should be removed. If the company is tiny it will be true. But in a most companies you will probably be in a different team or department. How do I remove myself from “Who you'll work with” company page?